As someone newly arrived in Northumberland from the Lake District we’re often asked. “Why would you move here from Cumbria”. Our reply is along the lines of. “Northumberland has everything that Cumbria has, well less a few lakes, but Northumberland also has lots of extra things to offer. Magnificent countryside, a superb coastline, numerous castles and sites of historical interest, easy and convenient access to centres of culture and entertainment, and all this within the least densely populated county in England. My other half says I must not forget the great opportunities for retail therapy, as if I could. I don’t know if we’ve lived here long enough to be considered Northumberland adoptees or whether we’re still on trial, but can I say in our submission that we’ve bought a Northumberland Flag that we proudly fly. There are so many places that we want to visit and so many things we wish to do that we’ve started a list, but have not yet made much of an impression on it, apart from the shopping which we’ve attacked as though the shops are going to close down tomorrow. Being able to drive to the Metro Centre in under 30 minutes and catch a bus directly to Marks and Spencer in the centre of Newcastle, (other retail stores are available), is nothing short of a wonder to us as previously it took us 15 minutes to drive to the nearest shop, and the volunteer bus ran once each day 3 times a week. We have visited a few places, Newbiggin-by-the-Sea to view the Couple Sculpture which is quite something. 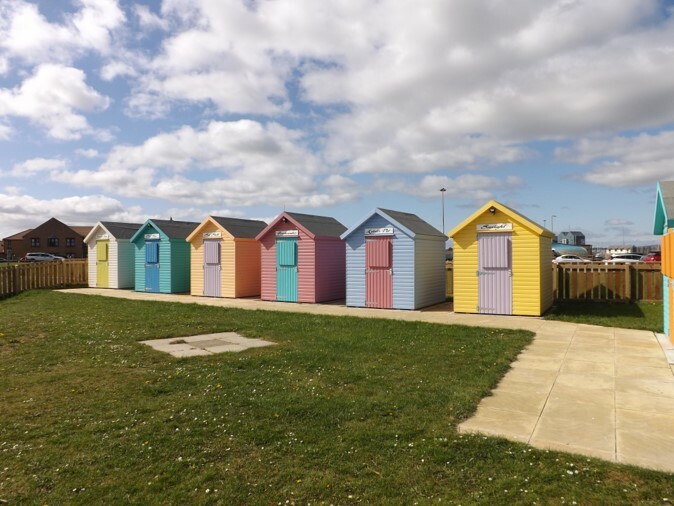 We walked around Amble and along the jetty, fell in love with the cute beach huts which we intend to book for a day and pretend we’re kids again at the seaside. Of course it’s compulsory to buy one of the delicious ice creams from Spurreli’s whilst in Amble, and who are we to deny compulsion? Whilst on the subject of food, well ice cream is sort of food, we had a truly superb afternoon tea at Matfen Hall and that is something we are definitely going to do again, and the sooner the better. 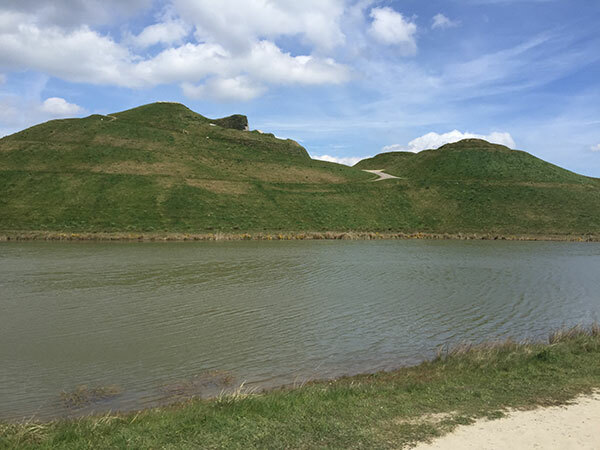 We have also been to Northumberlandia which we enjoyed very much and it is a great place to walk around and take photos, what’s more it’s free to park the car and visit, but please leave a donation in the box, and visit the little café for refreshments after your bracing toddle. Situated between Cramlington and Bedlington is Plessy Woods where we spent an interesting morning walking around this peaceful area which is bordered by the River Blyth. There are picnic sites, open grass areas, trees obviously, and lots of trails and paths. Pegwhistle Burn runs through the site with little bridges crossing it and there’s a former quarry that we found particularly interesting as we lived for many years in a house that was built in a former quarry. No doubt the area abounds in wildlife but we did not spot much out of the ordinary on our visit. One specific visit we have managed to make was to Queen Elizabeth II Country Park at Woodhorn near Ashington. It’s a lovely spot with a lake and surfaced walks, fishing spots, free parking and the Woodhorn Grange Pub and a Motel. 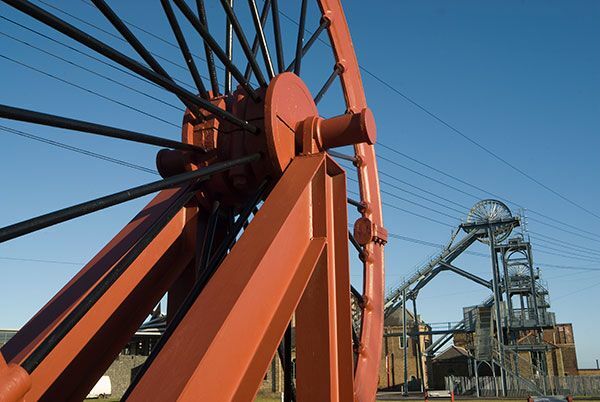 Close by the park is the Woodhorn Mining Museum where we discovered lots about the 800 years of mining history, enjoyed the exhibits and the Pitmen Painters and looked around the old mine buildings. There were lots more things we could have done but didn’t, so we’ll have to visit again, after we’ve checked their website so we can coincide our visit with one of the many activities taking place there. There is also a shop where amongst other things one can purchase items made of Northumberland Tartan, yes there is a Northumberland Tartan and Northumbrian Bagpipes too. The centre café is not to be missed, especially if you are a ‘scone aficionado’, (which we are, having attained Black Belt level in scone eating). Although we visited Woodhorn Museum on a separate visit as there was so much to see, one could visit the museum whilst visiting the country park. There is a little train which I think used to pull coal wagons in the mine, that runs from the park to the museum and the cost of the ride is minimal and enjoys lovely views of the lake, so nature and industrial history all in one visit, and did I mention the scones? There is lots more for us to see and do in Northumberland and we are looking forward to our next visits which must include some of the many castles and historic house that abound virtually on our doorstep.